Calling fabric artists, textile lovers, yarn workers and otherwise inspired folks to explore creativity, and launch our new TORAH GARMENT project. Following the model of the cover of our first Sefer Torah that has the word OR (light) at its center, we will explore the NESHAMAH, which will appear at the heart of the new cover that we will create for our second Sefer Torah. We are joined by a fabric artist who has prepared eight pieces of fabric for us, which can be filled using a range of embellishment techniques such as knitting, embroidery, applique, tatting, crochet, or quilting. If you are interested in crafting a segment, or intrigued by the concept of neshamah, don’t miss this gathering. (If you can’t make it, and are interested in collaborating on the project, please be in touch with Rabbi Liz). *KEHILLAH = Community, for every Age, Heart, Body & Soul! 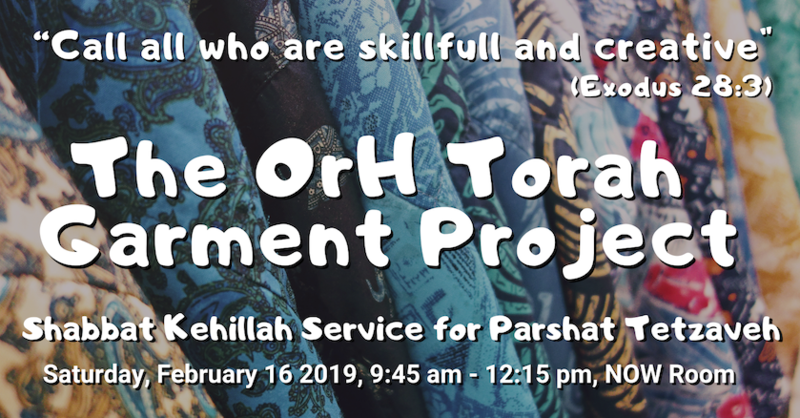 Each Kehillah Service features a short musically—driven service and a potpourri of activities led by ORH members and Rabbi Liz, addressing a theme or concept related to the season or the weekly torah portion.